While my cousin and I were on the phone one day, the topic of crescent rolls came up, and we start talking about how we both loved them. Then, I started thinking about the honey butter crescent rolls at California Dreaming. Then, my mouth started to water, and I wanted some crescent rolls. Even though I wanted to make some the really easy way, the thought of doing something a little different had crossed my mind, so off I went to the grocery store. First, we’re loading up on our necessary ingredients for the crescent rolls, and it’s super easy. 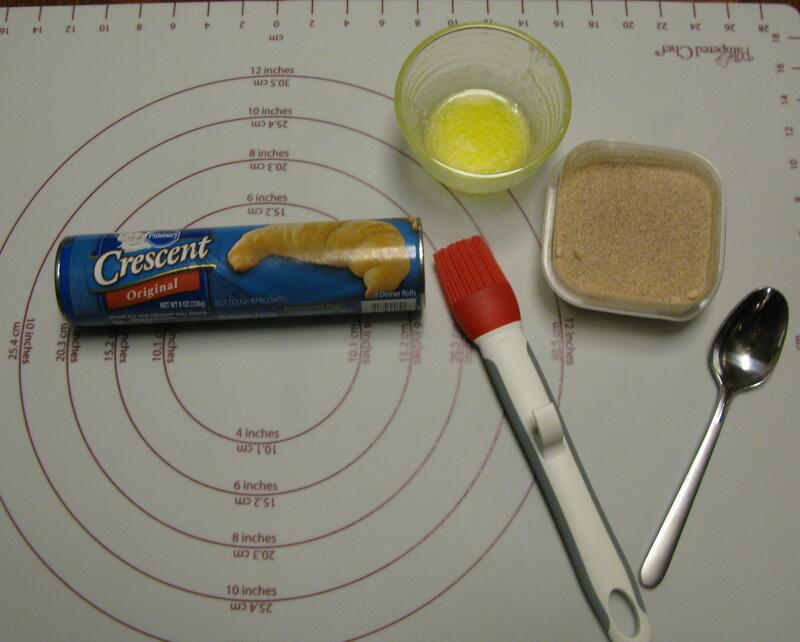 Here, we have a can of refrigerated crescent rolls, melted butter, cinnamon/sugar mixture, silicone brush, and a small spoon. Let’s get started. 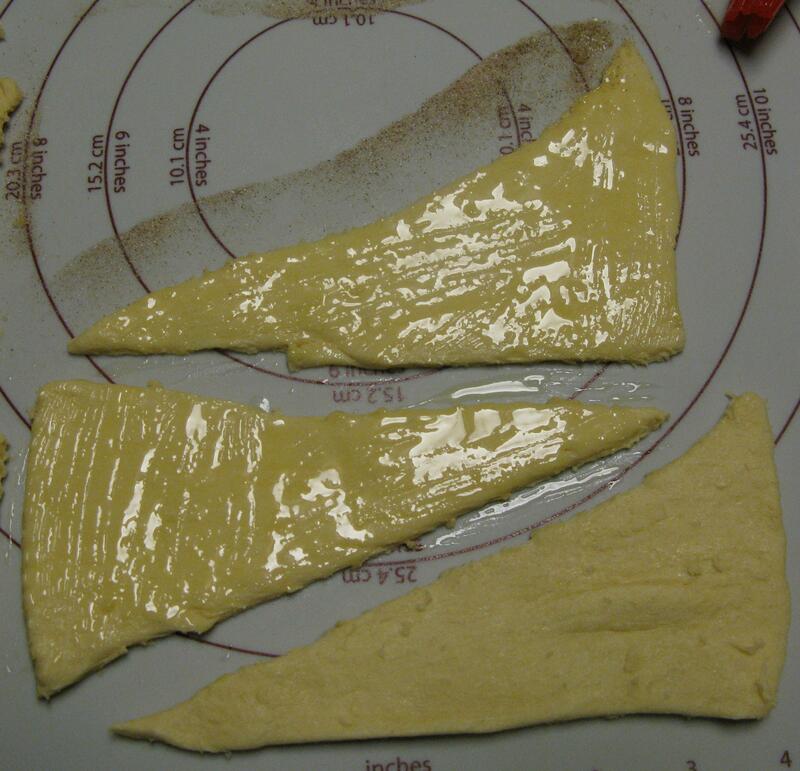 Unroll the crescent roll dough on a work surface, and brush each crescent roll generously with the melted butter. Using the spoon, sprinkle the cinnamon and sugar mixture over the melted butter. Roll up the crescent rolls, place on baking sheet (I always use my baking stone for best results), brush with more butter, sprinkle with more cinnamon and sugar…and bake. 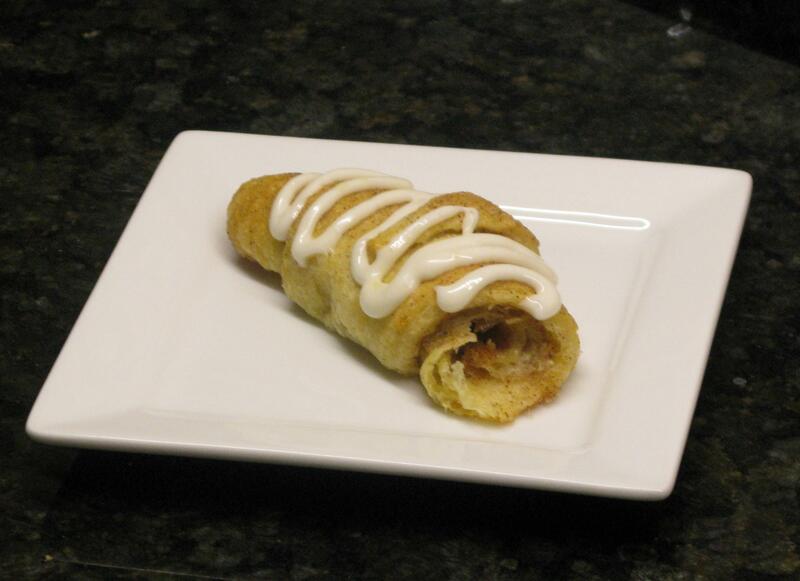 While the crescent rolls are still slightly warm, drizzle the cream cheese glaze on top of each roll. Enjoy…but be careful. They’re quite delicious…and also very versatile. They can be served as breakfast, appetizer, dessert, or just plain old side item. So many options with such an easy and delicious recipe! Preheat oven to 350 degrees. 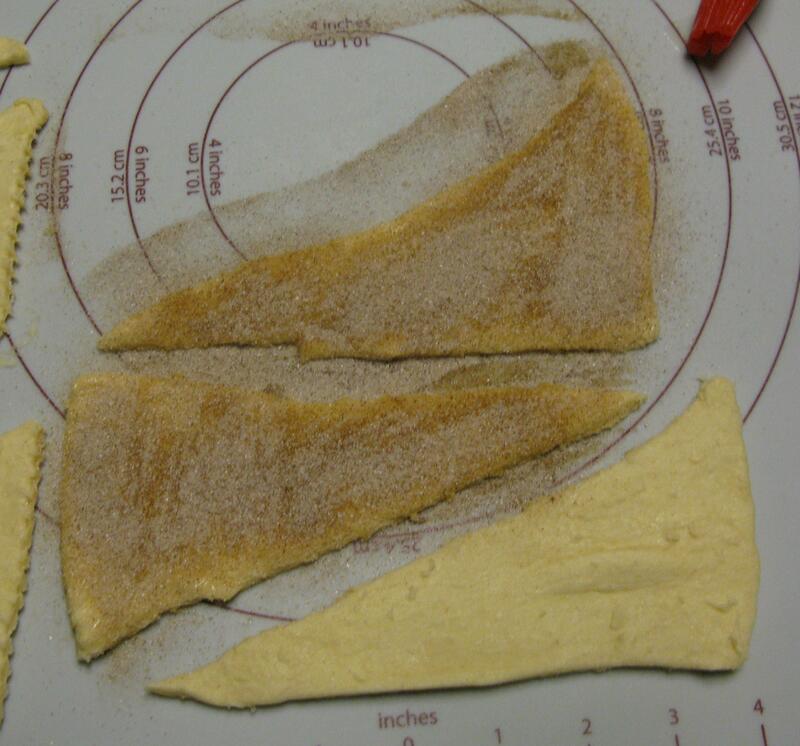 Unroll crescent dough onto work surface. Brush melted butter on each roll, then sprinkle cinnamon/sugar mixture on top. 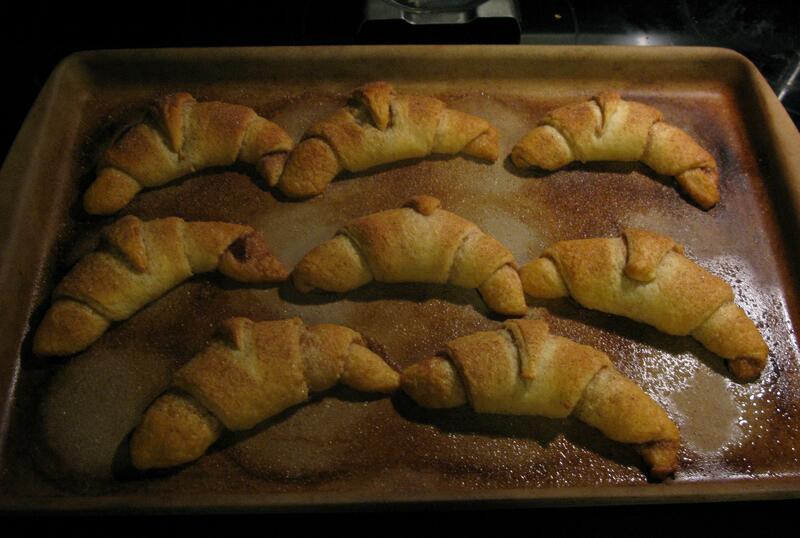 Roll up each crescent roll, then place on baking pan. Brush tops with more butter, sprinkle with more cinnamon/sugar mixture. Bake for approximately 10-12 minutes, or until tops are a light golden brown. When finished baking, remove from pan and drizzle with cream cheese glaze. Using electric mixer, cream the butter and cream cheese until blended. Add powdered sugar, vanilla and milk, continue to mix until glaze reaches desired consistency. 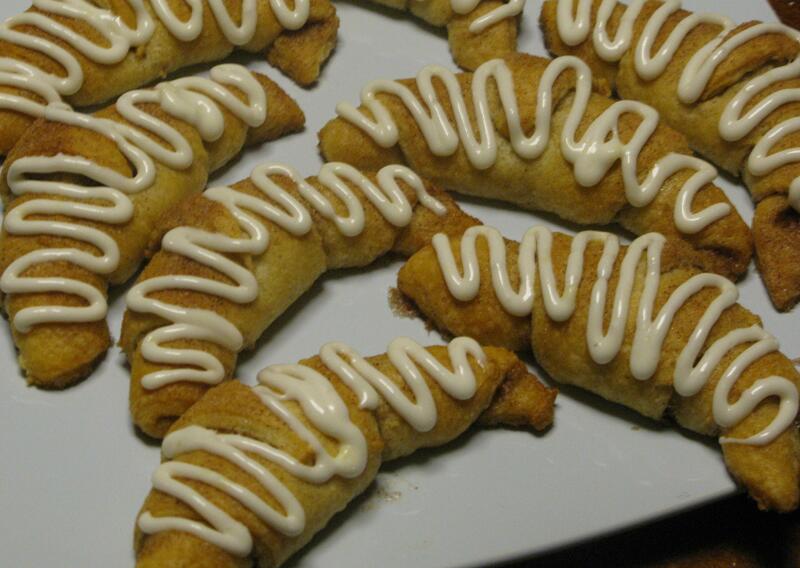 Drizzle over crescent rolls. I could go eat at California Dreaming and have a plate full of their crescent rolls! Love em, love em, looooove them. These look even more sinfully delicious and I actually could indulge and no one would ever know. Wait. No one would ever know as long as I worked out for the next few days.